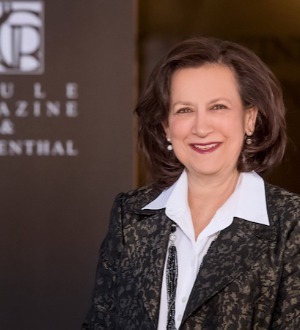 In her over 30 years of practice, Alisse Camazine has become one of the leading family law practitioners in the St. Louis area, focusing on child custody and complex divorce and property litigation. She has been listed in Naifeh and Smith’s, The Best Lawyers in America, for Family Law, since 1993. She became a Fellow of the American Academy of Matrimonial Lawyers in 1988 and has been certified as an arbitrator by the Academy. She received the Women’s Justice Award for Trial Practice from Lawyers Media in April 2009, recognizing women who have demonstrated leadership, integrity, service, sacrifice, and accomplishment in improving the quality of justice and furthering the highest ideals of the legal profession. She is ranked annually by St. Louis Magazine as one of St. Louis’s “Top Lawyers” for Family Law. Since 2005, she has been listed in Missouri & Kansas Super Lawyers magazine; she has been designated as one of St. Louis’s “Top Fifty Lawyers” and “Top Fifty Women Lawyers,” and was voted Missouri’s best divorce attorney in a poll conducted by the legal newspaper Missouri Lawyers’ Weekly, in October, 2007. In 2010, she was selected as “Lawyer of the Year—Family Law” by Best Lawyers. Ms. Camazine, along with her long-time law partner Alan Freed, co-authored the book Divorce in Missouri, which was published in April 2009. It is the only book available containing comprehensive information on Missouri divorce issues written for the lay person. She has co-authored many articles for legal journals and continuing legal education programs, including a chapter in the Missouri Bar Family Law desk book titled, “Enforcement of Judgments.” Ms. Camazine was also a contributing author to the text book titled Employee Assistance Programs, including chapters on Legal Issues and Drug and Alcohol Testing, published in 1988. Ms. Camazine has lectured on a wide range of family law topics for such sponsors of continuing legal education programming as The Missouri Bar, the American Academy of Matrimonial Lawyers, the University of Missouri, the University of Missouri-Kansas City, the Bar Association of Metropolitan St. Louis, and the St. Louis County Bar Association on topics such as Property Division in Complex Dissolution Cases, Ethical Issues in Family Law, Psychological Testing in Custody Cases, and Ethical Issues for Psychologists in Custody Cases. She has co-authored many articles for legal journals and continuing legal education programs. Ms. Camazine handles family law cases including division of complex property cases, spousal support, paternity and child support. She is well known for her handling of and complex child custody cases involving mental illness, addiction, sexual, physical, and emotional abuse, orders of protection and adult abuse orders motions to modify. Ms. Camazine is well known for her trial strategies and her expertise in the court room and handles lengthy, complicated custody and divorce matters. Ms Camazine is a member of the Family Law Sections of the American Bar Association, the Missouri Bar, and the Bar Association of Metropolitan St. Louis. She holds the “AV” rating of the Martindale-Hubbell Legal Director, the highest rating an attorney can achieve. Paule, Camazine and Blumenthal is a full service Firm that benefits our family law clients by having attorneys in the Firm with particular expertise in business organizations, real estate, tax matters, corporations, immigration, intellectual property, civil litigation, and high net worth estate planning. This allows cost effective handling of complex and high net worth cases involving business valuations, business issues, real estate issues, trust and estate matters, and tax problems, unlike boutique-style Firms specializing only in family law. In addition to her practice, Ms. Camazine is a board member and founding member of Earthwide Surgical Foundation, an organization involved in providing medical and surgical care to third world countries. She frequently travels to Nigeria to assist in the operating room of a small village hospital. She is a founding member of Caring for Kids, Inc., an organization responsible for providing essential needs to children involved in the court system and foster care.